When it comes to stair lifts, there’s no one size fits all solution. The options available as are varied as the homes they’ll be put in. Because of that, the answer to the question, “How much is a stair lift?” isn’t quite straightforward. The cost of the unit will depend on where it will be installed and the unique needs of the people who will use them. Though electric stair lifts have many different features and options, you may be surprised to know that the main thing that determines the price are your stairs. Specifically, the shape of the stairs you have at home. Let’s say your staircase just goes straight. It would be relatively simple to install a stair lift there. But when you have a stairway that has turns, landings, or anything else that will prevent a single straight path for the lift, this added complexity will influence the price. With that in mind, let’s take a look at how much they actually cost. The average cost of a straight stair lift falls around $2,500 to $5,000. This price range may seem a bit wide but that’s because different models have different sets of features. The dimensions of the stairs and the length of the railing needed are also things that have to be considered. Many people choose stair lifts that cost about $3,500 to $4,500 which should include professional installation and warranty for the unit. In terms of features, some models can have retractable rails, folding seats and footrests, chairs that make it easier to get in and out of the lift, and many others. Of course, more features means a higher price. This is also part of the reason why no two lifts cost exactly the same. Think about the level comfort, safety, and style you want to get a better idea of what budget to set. Curved stair lift prices start at around $8,500. Like straight lifts, this should include professional installation and warranty. But unlike straight stair lifts, it’s not as easy to come up with a price that most people pay. As we mentioned earlier, the biggest factor that affects the price is the shape of the stairway. Straight lifts used standardized rails that simply need to be cut to the appropriate length. But for curved stair lifts, the rails need to be customized to match the bends and turns of the staircase. There’s also the fact that not all stair lifts can be used on curved rails. Only certain models have the mechanism needed to work on turns and this affects the price as well. All of the comfort and safety features available on straight lifts are likely available for curved models too. For a more accurate estimate, you’ll need to have your stairs looked at by a professional. Call us today to setup a no obligation quote to get a better idea for your situation. It’s not a stretch to compare purchasing stair lifts to buying a car. More features can make a car more expensive but you get a lot of convenience along the way. And like buying cars, getting something new isn’t the only option. Used stair lifts are also available if you’re on a tighter budget. The great thing about pre-owned stair lifts is that each unit is fully restored and refurbished. All the important parts are replaced to ensure its safety and reliability. They’re practically good as new! That being said, they do have their limits. Maintenance for older models can be an issue, especially if they are no longer in production. It can also be more difficult to find refurbished stair lifts that are a perfect fit for all of your needs. They were initially made for some else, after all. And in some cases, refurbished units may only have a limited warranty. Considering all of this, it’s possible to save about $500 to $1000 compared to a new unit. This makes refurbished stair lifts a compelling option to look into. There are some situations where regular stair lifts just aren’t enough. It may be necessary to get models that were designed for certain conditions. The two most common scenarios are properties that need stair lifts for outdoor setting and stair lifts that are able to carry heavier passengers. Outdoor stair lifts are built to withstand the elements such as the rain, cold, and heat. They also provide some protection for the rider as well. That extra robustness and protection make it cost more than an indoor model but it could be worth it if it allows you to fully enjoy your property. If weight is a concern, heavy-duty stair lifts are another option. They’re designed with stronger components such as more powerful motors that can carry heavier passengers. Depending on the model, they can handle around 300 lbs. or even more. Aside from the purchase and installation of a stair lift, there also ongoing costs to keep in mind. Going back the car analogy, regular maintenance is also part of owning a stair lift. A reasonable maintenance schedule to stick to is once a year. You can expect to pay around $100 annually to keep the stair lift in good condition. That’s a small price compared to more costly repairs that can be avoided through proper upkeep. If you’re thinking that a few thousand dollars just for something that helps you move through stairs is too much, think about the alternative. For many older people, that means moving to an assisted living facility. The average cost of assisted living can range from around $2,500 all the way up to $6,700 per month depending on which state you live in. This is according to the 2016 Cost of Care Survey from Genworth, a long-term care insurance provider. Even the most expensive stair lift can pay for itself within a few months if you compare it to those amounts. And it’s not all about the monetary costs. 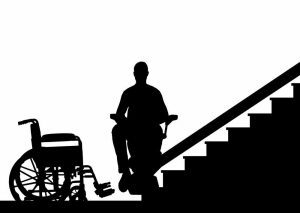 Just imagine having to leave your home and losing your independence all because of stairs are giving you trouble. It’s a situation that most people don’t ever want to experience. Luckily, there are more options than ever that help senior citizens live a safe, comfortable, independent, and dignified life in their own homes. Take advantage of these opportunities to continue enjoying the fruits of your labor. No matter the type of stair lift you’re interested in, the best way to find out how much it will cost is through an inspection by a trained professional. Schedule a free consultation by calling us. We’ll provide detailed estimates based on the exact specifications of your home and the features you need.